88003 passes Foley Park hauling 1347 Kidderminster to Bridgnorth on 18/05/2017. Brad Joyce, 47 Edwards Drive, Stafford. ST16 1LZ. 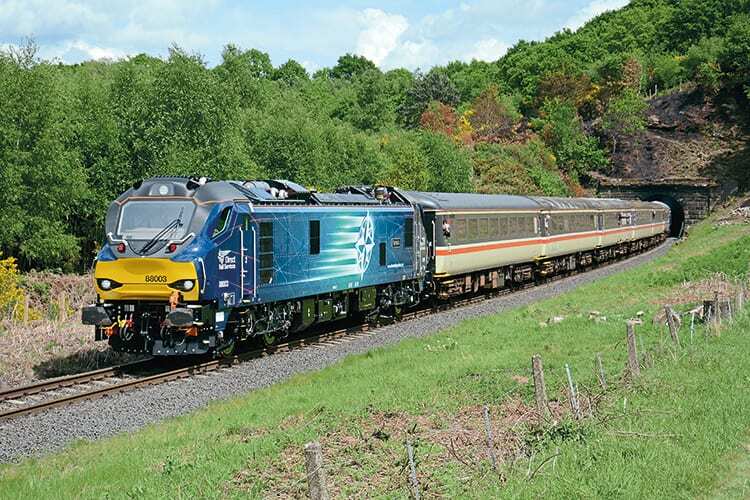 A DRS Class 88 topped the list of 17 visiting locos for the Severn Valley Railway’s recent three day gala, an event which marked 30 years of dedicated diesel events at the heritage line. THE Severn Valley Railway’s diesel gala on May 18-20 once again proved to a highlight on the heritage calendar. No less than 17 visiting locos joined half a dozen from the home fleet, the event marking 30 years since the line held its first dedicated diesel gala in 1987. The star attraction was virtually brand new No. 88003 from Direct Rail Services, the dual-mode machine working on the first two days, but crewing issues meant it spent the third day on shed at Kidderminster (May 20 also clashing with the main line tour with No. 88002, see pages 80 and 89). Other highlights included red-liveried No. 60100 from DB Cargo, one of the last Class 66s No. 66771 from GBRf, the launch of No. 47828 in InterCity Swallow livery, IC-liveried No. 50031 matched with IC stock, the relaunch of ‘Teddy Bear’ No. D9551 (back into service after more than a decade), and ‘Western’ No. D1062’s first gala appearance in its recently-applied blue livery. ‘Peaks’ Nos. 45041 and 45060 also took part, believed to be the first time two Class 45/0s have operated at the same event in preservation, while there was a rare chance of haulage by Ruston 0-4-0 No. 319290 – making its first appearance outside Bewdley Yard for several years on brake van rides at Highley. The ambitious programme largely went to plan, although there were a few small hitches over the three days. GBRf ‘ED’ No. 73965 was not in the best of health and missed some of its booked turns, while No. 47828’s new look was not quite ready to work the first day. The Class 88’s workings were particularly well loaded, although there was disappointment on the second day when it was unable to work its booked 16.54 Bridgnorth to Kidderminster. This was a knock on effect of the unavailability of No. 73965, with No. 50031 being substituted instead and the ‘50’ and ‘88’ being unable to work double-headed over Victoria Bridge.